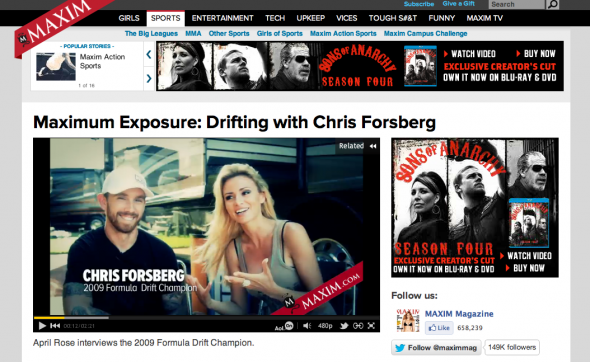 April Rose of Maxim Magazine interviews the 2009 Formula DRIFT Champion Chris Forsberg. The #USAFdrift competition is down to the final two. Who will win a flight in an F-16? Posted in Videos | Tagged drifting, Falken Tire, Ford Mustang, Ford Racing, Formula D, Formula DRIFT, Las Vegas Motor Speedway, Monster Energy, Round 6: After Dark, Vaughn Gittin Jr.
Long Beach, Calif. – August 26, 2012 – Formula DRIFT returned to the Las Vegas Motor Speedway for Round 6: After Dark. Rhys Millen in the RMR / Hankook Hyundai Genesis Coupe takes the victory and moves up to third place in the overall points standings leading into the final event of the season. Round 6: After Dark brought drifting back to Sin City and treated fans to a night spectacle that included the Vegas ProAm championship, Slammed Society car show, Targa Trophy display of vehicles and more. The Driftstream saw an estimated 150,000 viewers in a 24-hour period. A new track configuration was added to the event at the Las Vegas Motor Speedway giving an extra challenge for the drivers to adjust to the new course along with the weather conditions of the desert. Robbie Nishida in the Bridges Racing / Achilles Tires Lexus SC300 faced points leader Vaughn Gittin, Jr. in the Monster Energy / Falken Ford Mustang in a battle for third place. Gittin took the win and secures his point lead in the chase for the championship. The final battle pitted second place qualifier, Rhys Millen, fresh off his record setting victory at Pikes Peak in the same Hyundai Genesis Coupe that he competed in at this event, against the number one qualifier, Frederic Aasbo in the Need for Speed / Hankook Scion tC. On his lead run, Aasbo met the wall to give the advantage to Millen. On the second run Millen kept a consistent line to take the victory moving him to third place overall and within striking distance of the point leaders. The chase for the championship is as tight as it has ever been and will be decided at the final event of the season. The Formula DRIFT Pro Championship Round 7: Title Fight on October 12-13 at Irwindale Speedway. Tickets are on-sale now and can be purchased on the Formula DRIFT website.